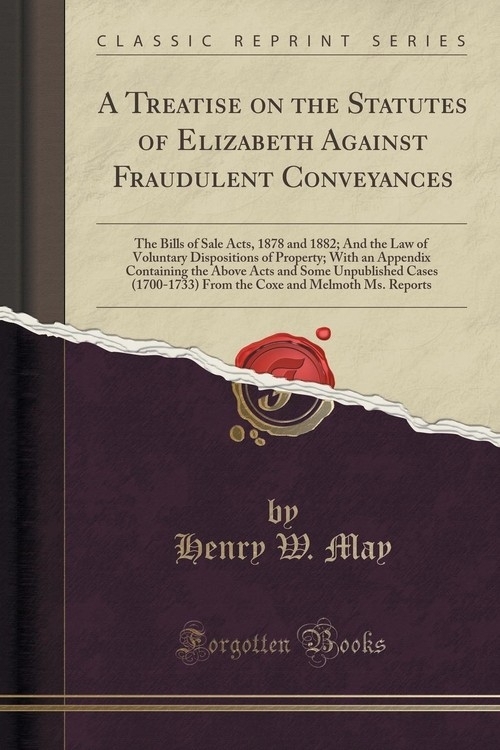 Opis: A Treatise on the Statutes of Elizabeth Against Fraudulent Conveyances - May Henry W.
Since the First Edition of this hook was published, there have been great changes in the Law relating to its subject-matter. The law relating to bills of sale has - in consequence of the Bills of Sale Acts. 1878 and 1882, and of very numerous and important decisions upon these two statutes - undergone great alteration. The Married Women's Property Act, 1882, has expressly enacted that settlements by a married woman shall be void against her creditors in cases in which similar settlements by a man would be so void. It has also enabled a married woman to acquire and to confer any property by gift or contract; and, by giving her, as her separate property, property in which, but for that Act, her husband would have had an interest, will probably have the effect of making settlements by her voluntary which otherwise might have been deemed for value. The Bankruptcy Act, 1883, has also to some extent modified the law as to voluntary settlements. There have been many decisions of importance on the Statutes of Elizabeth, such as Crossley v. Elworthy, Mackay v. Douglas, Ex parte Mercer, In re Ridler, Price v. Jenkins, Lee v. Mathews(in Ireland), In re Foster and Lister, and Mackie v. Herbertson, which have materially altered or modified the law on the different points they dealt with. A large number of cases have been decided upon the complicated subject of voluntary dispositions of property unaffected by the Statutes of Elizabeth. Szczegóły: A Treatise on the Statutes of Elizabeth Against Fraudulent Conveyances - May Henry W.
Recenzje: A Treatise on the Statutes of Elizabeth Against Fraudulent Conveyances - May Henry W.